Many years ago when our two youngest were still at home, we took a vacation in Wisconsin. When Sunday came, we decided we’d drive around and stop at some church we saw. Our jaws dropped at the freedom we saw in the singing at the church we stopped at, and I remember longing to have that freedom of expression. The pastor there left an impression on us, not because of his sermon, but because of His actions while singing. Some antonyms of “power” are weakness and inability. Exactly the way we can feel sometimes, isn’t it? So weak and weary. No ability to change what’s happening in our lives. No power to continue on. It’s in these very moments, when we are in that weakness, that God shows us His power. If we always have our own strength to depend on, we don’t need His. But when there is nothing left in us, His power bursts forth. Yes! There is POWER in the blood of Jesus! POWER to marvelously create you and me. POWER to raise Jesus up from the dead. POWER to bring people out of their graves. POWER to wash us clean from all our sins. POWER to release us from all condemnation. POWER to free us from the chains of any kind of abuse. POWER to reach and embrace that hurting child within us. POWER to stop the accusing finger of shame and make us guilt-free. POWER to release the bonds of bitterness and give us forgiving hearts. POWER to free us when legalism swings its swords. POWER to lift us out of the deepest, darkest pit of despair. POWER to keep us from drowning in troubles and losses. POWER to boot out the fear that chokeholds our lives. POWER to sweep away our insecurity and give us security in Christ and who He says we are. POWER to stamp out Satan and all his lies and believe in the Truth of God’s promises. POWER to lift us up again out of any situation or circumstance that has knocked us down. POWER to give us wings to fly in the freedom and fullness of the love of Jesus. POWER to supply us with all our needs for this time and for eternity. I heard an example once of faith. Consider a light switch. The electricity is there, but it will not give power to light the room unless we flip the switch. The POWER in the blood of Christ is always there waiting for us to tap into it. But we need to turn it on. It can be hard when troubles get us down, but may we lift up our weary souls and plug into the ultimate Power Source, Jesus Christ. Lord Jesus, thank You for shedding Your blood for us. Truly, there is POWER in Your blood. You know the hearts of each of us, how hard it is sometimes to plug into Your power. Give us strength to lift up our discouraged hearts and have faith in You and Your power. In Your strength we can do all things. Please stamp out all that keeps us from believing in Your power to do what seems so impossible from our side. to embrace the power in Jesus! Thank you, Joy. I’m so glad it held meaning for you. That power is so amazing, isn’t it? Yes, a truth we so often need to be reminded of. It’s so easy to forget when we feel drowning in troubles and cares. He brings us to that place where we find nothing in ourselves but all in Him, and sometimes that can be a very rough road. May you find a “deeper abiding and rest in the Lord” and His liberating promises, Joy! Hugs! This is so POWERful, Trudy ;)! I spend so much time focused on my weaknesses. I forget we are designed that way so we can find our power in Him. Thank you for this wonderful reminder! Thank you, Candace. I’m glad you found POWER in it. 🙂 I, too, spend so much time focused on my weaknesses. As I wrote this I was trying to convince myself at the same time. May God’s POWERful spirit work in you and give you hope and peace! Hugs! Thank you, Kim. I’m glad you enjoyed it. Thanks for stopping by. May grace and peace be with you today and always! Hugs! You’re welcome, Karmen. Praying that POWER will heal your broken heart ever more deeply! Hugs! Hi Gayl. Thank you for returning the visit. 🙂 Yes, He is so faithful. He will give us the strength we need no matter what we go through. God bless you and give you strength for each day! Hugs! Beautiful post Trudy! Your story about the church you stopped at made me think of my grandfather. He was a minister in a small southern church and whether he was singing or preaching, he did it with a power that you knew was God inspired. Thanks for the reminders of the power we all have if we just choose to tap into it. Thank you, Monica. I’m glad it stirred up good memories of your grandfather. 🙂 May the power in Christ Jesus richly bless you! Hugs! I got goosebumps reading this. This is a very powerful message indeed. And especially love the example of flipping on the electricity switch to turn uon the power. I will have to remember to this to use with my young nieces. Have a blessed day. I’m so glad you felt the power in this message, Maria. There is POWER in the blood. It’s hard to understand sometimes that the Power Source is always there waiting for us to tap into it. I can imagine Jesus waiting and longing for us to come outside of ourselves to Him alone. May the blessings of His power enrich your life! Hugs! I’m so glad this helped you, Michelle. Yes, what He has done, He will continue to do! Thank you for sharing the text. It encouraged my heart. What an awesome God we have! We’ll have to keep pumping our fists together. 🙂 May that POWER in His blood give you ever deeper healing! Hugs! Yes, how fun that we are neighbors at Bonnie’s today! I am impressed with all the ways you reminded of us God’s power! And so much richness to consider in your words today. I also liked your memories of your visit to a church that worshipped different than you were used to. I think God delights to show us different ways to get to know him and shake up the borders that sometimes we contain him in! Hi Valerie. I love how you say God delights to show us different ways to get to know Him. At that time we had recently left the church we grew up in, the same one where abuse took place and God was portrayed as an angry Judge ready to send us to hell. So when we tried this church, it was refreshing though it was hard to get rid of the guilt that had been laid on us for so long. In the church we left, that song wasn’t even allowed. We are very grateful God shook up our borders! That He showed us how much love Jesus has for us and how much POWER there is in His blood. 🙂 God bless you and keep you! Hugs! Trudy, this was awesome. I love that image by Holly too. Yes, lets be wide open in surrender to him. Let’s lay it all down, give it all up and see it all through his eyes. Thank you for calling me deeper. I love knowing you. Cheering you from the #RaRalinkup on Purposeful Faith. Thank you, Kelly. Your cheerleading is a blessing in my life. 🙂 Sometimes those lies of Satan can be so strong, and I was just praying that I would see myself through Jesus’ eyes as His beloved. Now I go to my computer and see your comment “…see it all through His eyes.” This confirms my hopeful prayer. 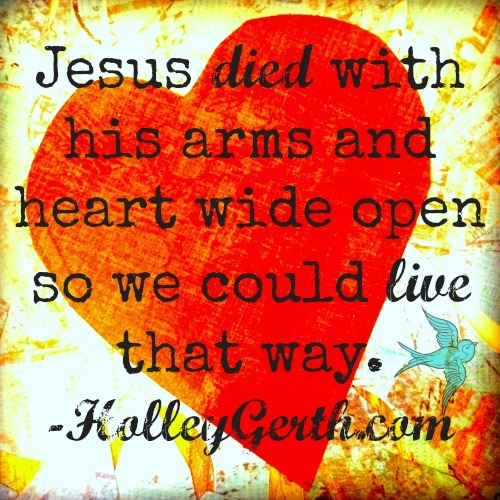 Yes, may we be wide open in surrender to Him! Hugs! hi Trudy! I love your comment prompt “Your Story Matters!” 🙂 you’re speaking my soul language! i love passionate i hear your heart through this post… the song like an anthem for your heart. thnk you for sharing this in the Beloved Brews linkup! It’s truly a beloved brew – as you share what God is whispering to you! Hi Bonnie! I’m so sorry. I just found your comment in my spam folder. You certainly are NOT spam. 🙂 You’re such a beautiful “real” person who has taught me so much to be “real.” You have been one of the people in my life who has encouraged me to believe my story matters, too. Thank you so much for taking the time to comment. May God keep you and lead you ever deeper into His healing love! Hugs! I’m so glad you were encouraged and motivated, Superwomanlux. May God fill you with His power! Hugs!